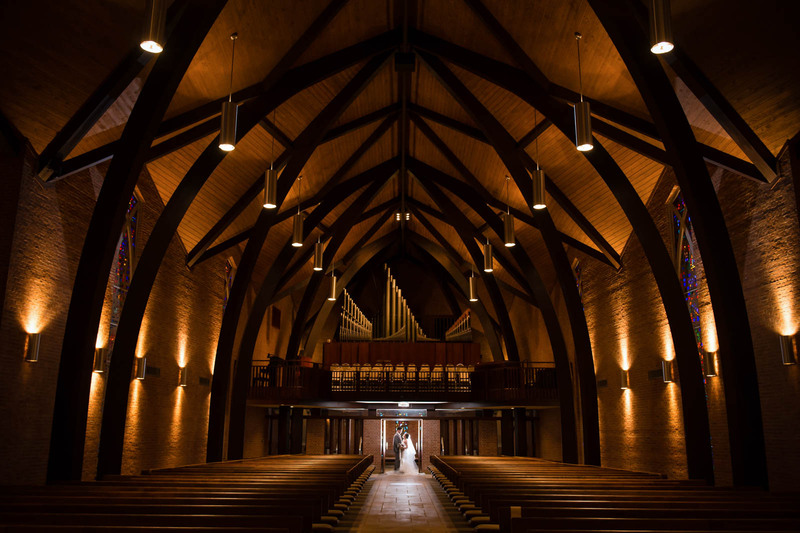 Westminster Presbyterian Church in Greenville, SC was the venue for Kristin and Anthony's February winter wedding. Luckily, in Greenville our winters are mild, so winter weddings are popular. And wow, have you ever seen a more beautiful church! The dramatic uplighting of the brick walls, the stained glass, the arched vaulted ceiling, and the network of arched wood buttresses that start at the floor and meet almost 100 feet above at the top. I love the way the pendant lights form a line that leads you to the pipe organ and bride and groom in the church doorway. The vibrant reds and oranges of the brick are striking when illuminated by the with glowing yellow wall lanterns. And you can just see the blue stained glass peaking through beams on the left and right sides. This fabulous wedding was coordinated by the always fabulous Allie from Upstate I Do, floral design by Urban Petals, transportation from East Side and The Trolley Company, catering by Good Life, wedding cake by Courture Cakes, entertainment by Sol Fusion, and videography by Jeff Bradt.